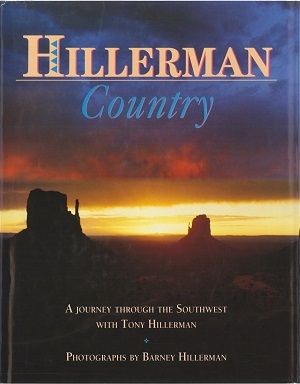 This is the limited first edition hardback edition of Hillerman Country, a photo-book that explores the southwest with Tony Hillerman's text and Barney Hillerman's photographs. This 1991 edition was published by HarperCollins Publishers in New York City, New York. This limited edition does not have a dust jacket, but instead, has a sandpainting embossed in silver directly on the red cloth boards of the front and back cover. Format: Hardback, 31.7 x 24.